Memory Text: “Suddenly there came a sound from heaven as of a rushing mighty wind, and it filled all the house where they were sitting. And there appeared. 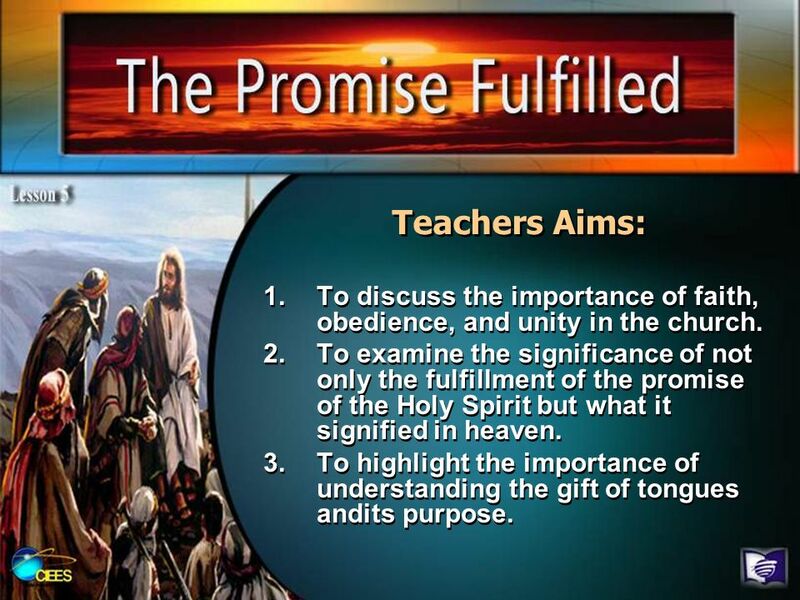 3 Teachers Aims: To discuss the importance of faith, obedience, and unity in the church. To examine the significance of not only the fulfillment of the promise of the Holy Spirit but what it signified in heaven. To highlight the importance of understanding the gift of tongues andits purpose. Lesson Outline: I. Gathered in One Accord (Acts 2:1) A. They stayed together physically. B. They prayed together and reached unity of heart. 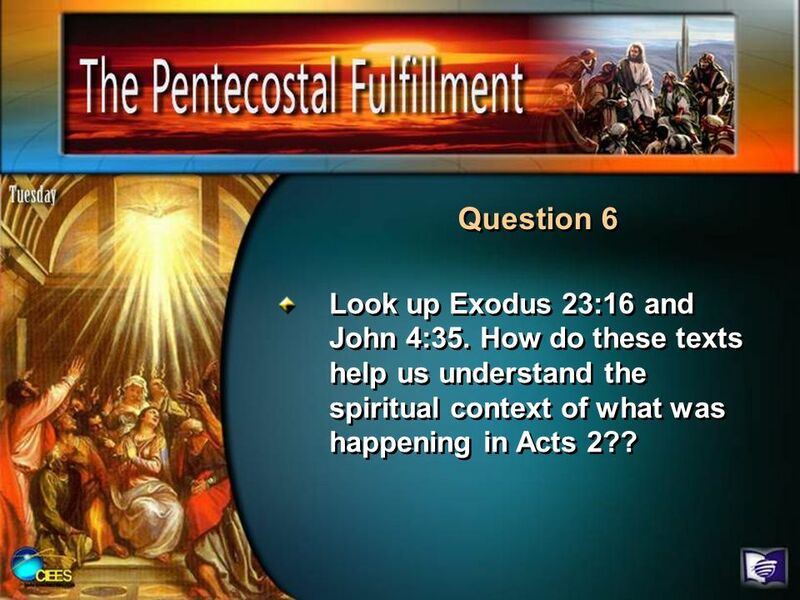 A. Pentecost—a celebration of material and spiritual blessings. B. Mighty wind and fire—represents the power and passion of the Holy Spirit. 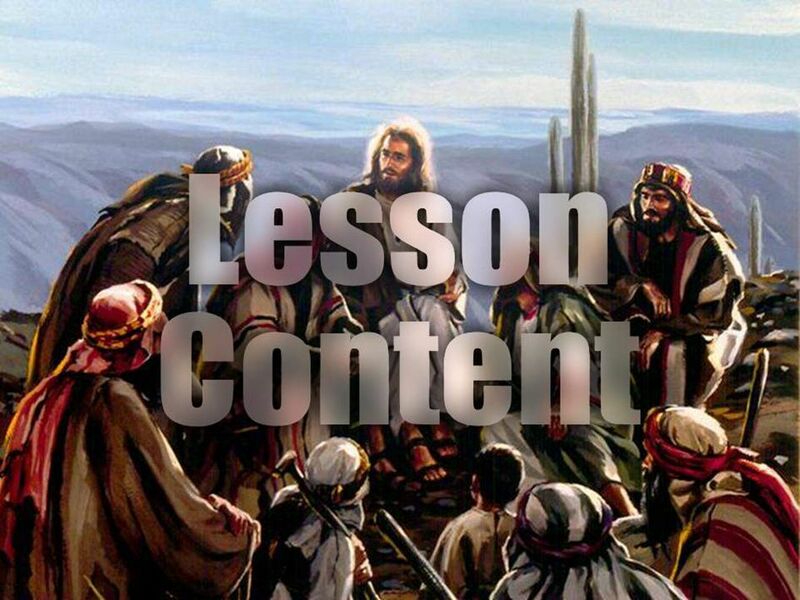 6 Lesson Outline: III. 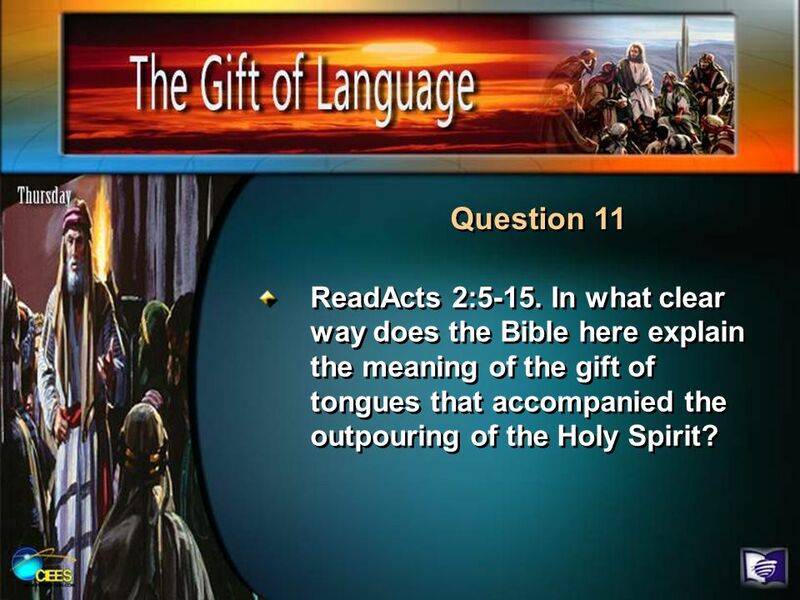 Like the Holy Spirit, Tongues Is a Gift From God (Acts 2:5-15) A. They spoke in languages they didn’t understand but their hearers did. B. Gibberish is NOT a sign of the Holy Spirit for His gift of tongues is meant to be understood. 7 Summary At the appointed time, and when the believers were united in their faith and willingness of heart, the promise was fulfilled. The gifts of the Holy Spirit were manifested in accordance with the needs of those God was trying to reach. 9 Introduction Christ’s completion of His sacrifice, followed by His resurrection and ascension, gave full release to the gifts and power of the Spirit (see Ps. 68:18, 19; Eph. 4:8-16). This bestowal was signalized at Pentecost by a marvelous outpouring of power to witness for Christ and to exercise divine gifts for the salvation of humanity. 10 Question 1 Read Acts 1:4, 5. Jesus talked about the promise that you “have heard of me.” What promise is He talking about? See John 14:16- 26, 16:7-13. 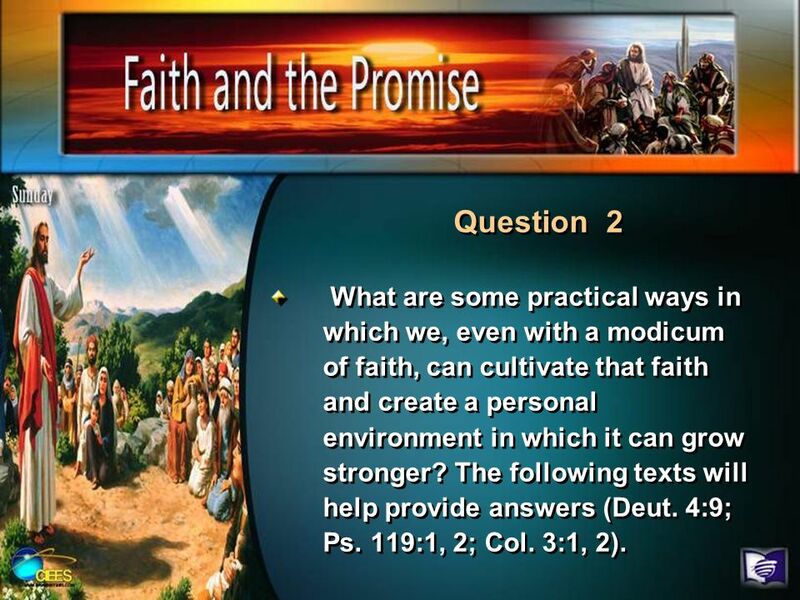 11 Question 2 What are some practical ways in which we, even with a modicum of faith, can cultivate that faith and create a personal environment in which it can grow stronger? The following texts will help provide answers (Deut. 4:9; Ps. 119:1, 2; Col. 3:1, 2). 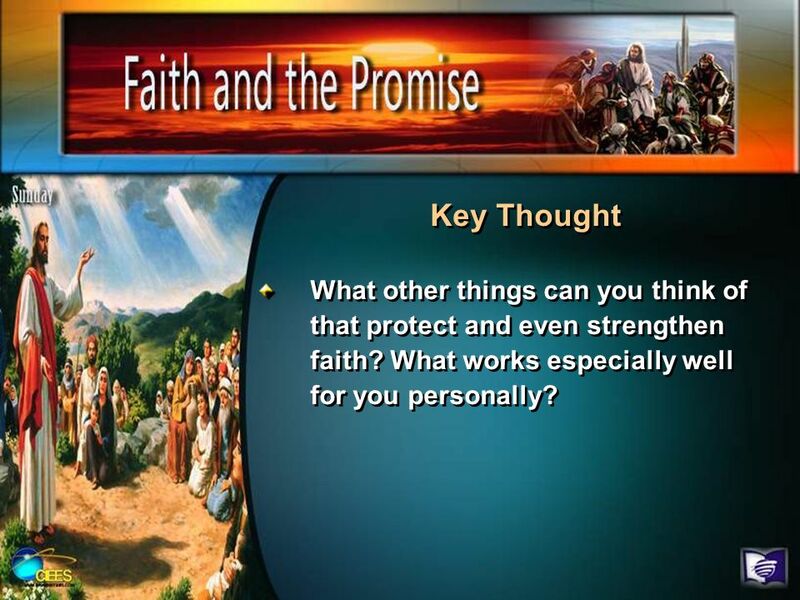 12 Key Thought What other things can you think of that protect and even strengthen faith? What works especially well for you personally? 13 Question 3 What other things can you think of that protect and even strengthen faith? What works especially well for you personally? 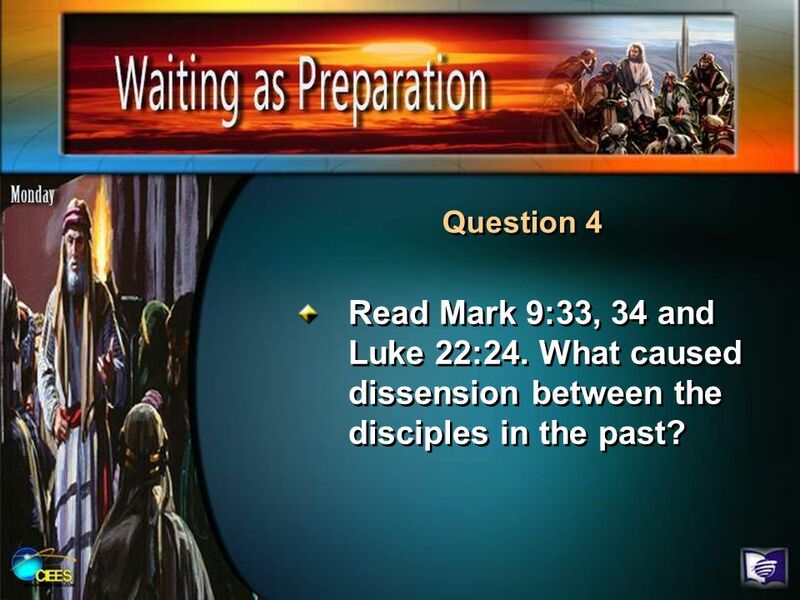 14 Question 4 Read Mark 9:33, 34 and Luke 22:24. What caused dissension between the disciples in the past? 15 Key Thought What are some of the things that work against unity in your own local church? What can you do to be a unifying force in your church?? 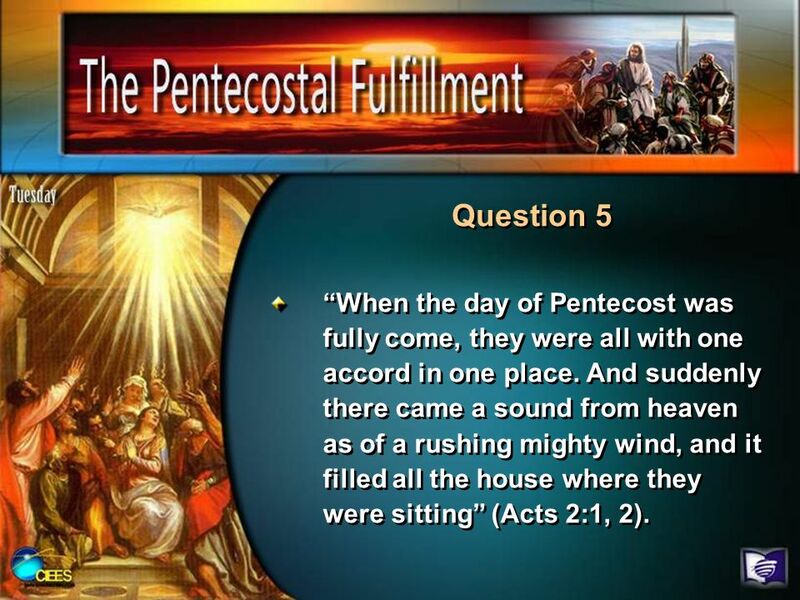 16 Question 5 “When the day of Pentecost was fully come, they were all with one accord in one place. And suddenly there came a sound from heaven as of a rushing mighty wind, and it filled all the house where they were sitting” (Acts 2:1, 2). 17 Question 6 Look up Exodus 23:16 and John 4:35. How do these texts help us understand the spiritual context of what was happening in Acts 2?? 18 Key Thought How do you understand your own role in the mission of the church to preach the gospel to the world? What role are you playing? What more could you do? 20 Questions 7-8 What contrast is Peter making there between David and Jesus? What was his crucial point? How central is Christ’s death and resurrection to Peter’s whole speech? 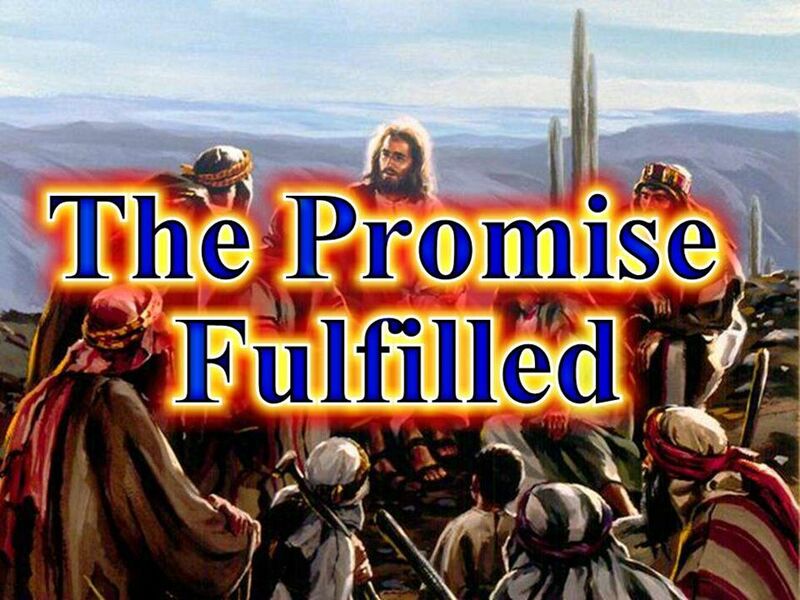 21 Questions 9-10 What was the promise of the Father? (vs. 33). What incredible event in heaven prompted this outpouring of the Holy Spirit? 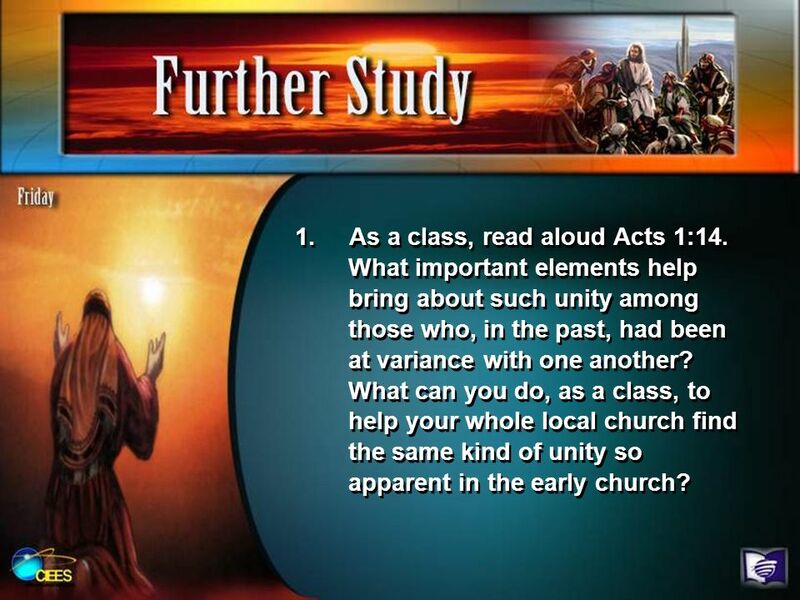 22 Key Thought: What does today’s study reveal to us about the close harmony between heaven and earth? In what ways can you be more sensitive to the reality of this close tie between heaven and earth? 23 Key Thought: What things might you have done in the past 24 hours that showed a callousness toward the reality of this close link? 24 Question 11 ReadActs 2:5-15. In what clear way does the Bible here explain the meaning of the gift of tongues that accompanied the outpouring of the Holy Spirit? 25 Question 12 What kind of languages were being spoken here, and why is this answer important for us today? 26 Question 13 Along with what’s here in Acts 2, read Mark 16:17. How does that verse help us understand what the gift of tongues meant? 1. As a class, read aloud Acts 1:14. What important elements help bring about such unity among those who, in the past, had been at variance with one another? 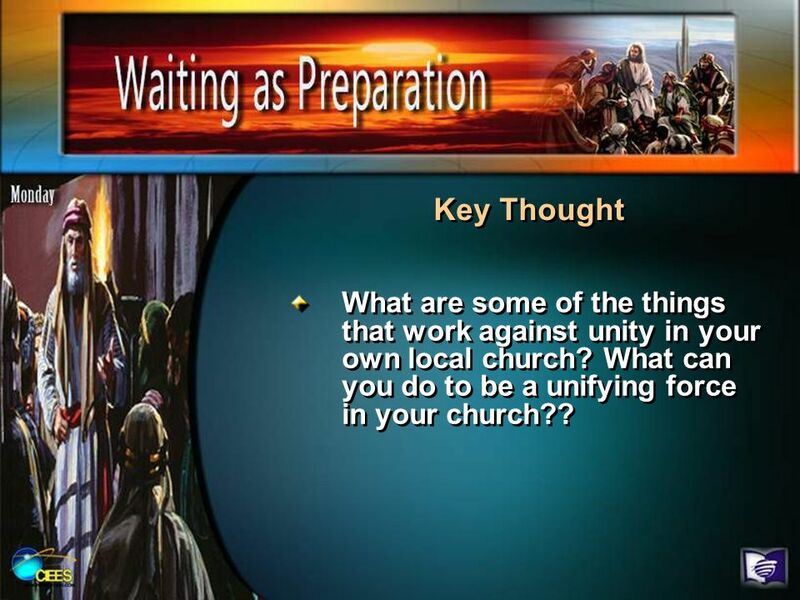 What can you do, as a class, to help your whole local church find the same kind of unity so apparent in the early church? As a class, read aloud Acts 1:14. What important elements help bring about such unity among those who, in the past, had been at variance with one another? What can you do, as a class, to help your whole local church find the same kind of unity so apparent in the early church? The “tongues” phenomenon has been growing. Why not, as a class, work together to create a good Bible study on this topic that you could give to help anyone with questions about “tongues”? 30 Summary At the appointed time, and when the believers were united in their faith and willingness of heart, the promise was fulfilled. The gifts of the Holy Spirit were manifested in accordance with the needs of those God was trying to reach. 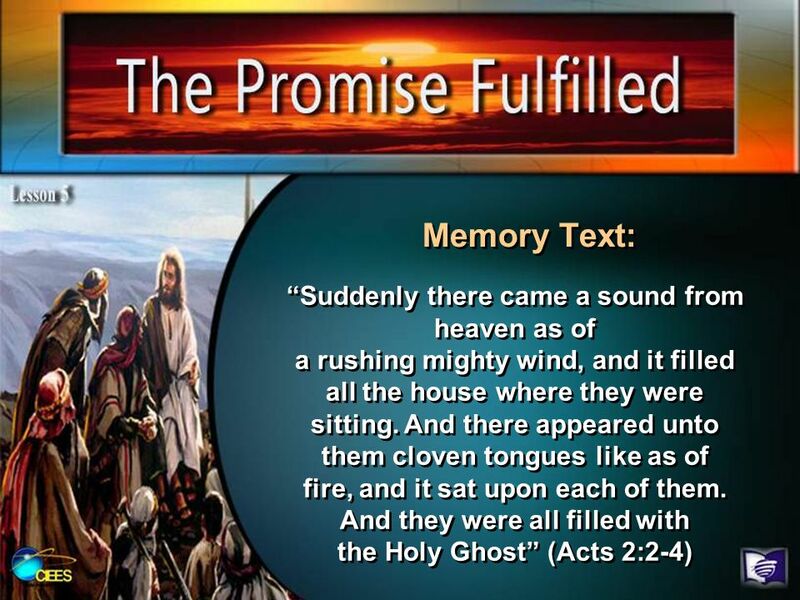 Download ppt "Memory Text: “Suddenly there came a sound from heaven as of a rushing mighty wind, and it filled all the house where they were sitting. And there appeared." Are You An Apatheist?. Are You An Apatheist? Apatheism Lack of interest towards belief or lack of belief in a deity or religion Applies to both theism. Dare to Depart in 2014: Lessons from a Herald to Samaria Acts 8:4-25 Message 1 in our 8-part series on the Acts of the Apostles. Sunday, January 4, 2014. 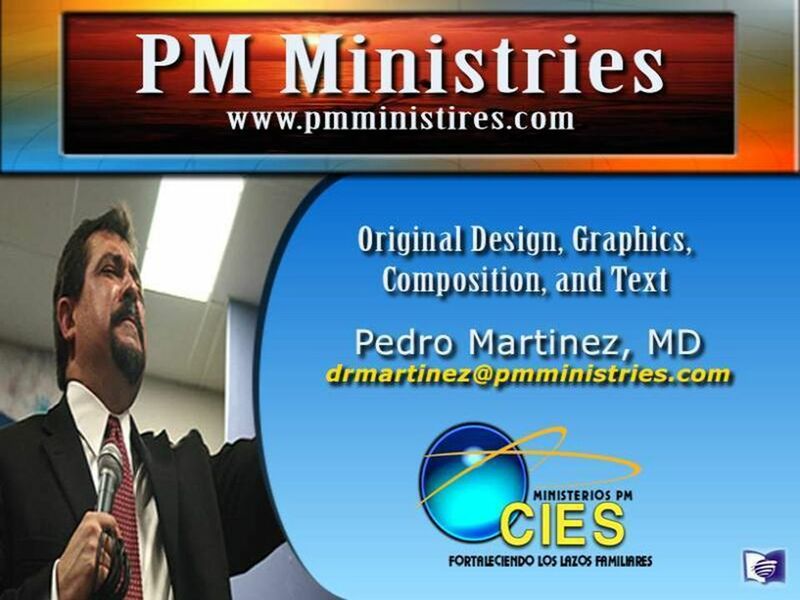 1 Lesson 19, Section Eighteen (Part 1) Problem Sixteen: Misunderstanding Spiritual Gifts First Corinthians 14:1-19 Page 93. BOOKLETS AVAILABLE 1.Suggested donation of $2 for small and $3 for large. 2.Write your name. 3.Join a small group bible study. 4.Begin to get to know. Good Eyes Matthew 6: A Good Eye Sees clearly and effectively Sight is a figure for spiritual perception, Matt. 13:14-15 – EYE: “metaph. the eyes. in Junior 2 Class, Garden Grove. Recollection The Doctrine of the Holy Spirit (2) Tongue speaking directed toward God (1Cor 14:2) Tongue speaking. Where Jesus Is John 14:1-6 Philippians 1: Where Christ Is Peace is found in absolute trust, 14:1 His word and work is the basis for our faith, 14:2-3.